This unique contemporary home felt like California with soaring vaults and floor-to-ceiling windows. We were enamored, just not with the small kitchen. 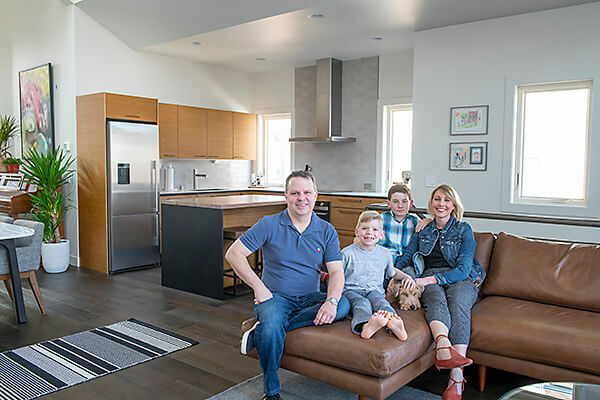 We’re glad we lived in the home with our two boys before making any changes, as we discovered the necessity to create a mudroom (which we got from the former kitchen space), and how one existing architecture element wasn’t working. The kitchen and mudroom use Puustelli’s Scandinavian Cabinetry Solutions, the leading, most eco-friendly cabinetry system available today. They multiplied our spaces, I call it cabinetry magic. Equally important, Puustelli listened to our needs and managed the entire remodel flawlessly. We’re eager to live life easier and more organized in this newly functional and inclusive kitchen/dining/living room.